The S&P 500 ended lower on Friday, closing within two points of its all-time high set last Wednesday, as Wall Street investors turned cautious over mixed earnings data and a shake-up in the White House Communications staff. While still early in the second quarter earnings season, preliminary reports so far show 75% have exceeded analysts’ consensus EPS expectations and 64% have surpassed consensus sales forecasts. Both statistics are tracking slightly lower than the prior reporting season, but are still above their long-term averages. The S&P 500’s price-to-earnings multiple remains below its March peak, despite the benchmark index reaching all-time highs. Many foreign equity markets have comparatively lower trading multiples. German and French shares trade at a trailing price-to-earnings (P/E) of as low as 18.9 versus the S&P 500’s 21.6, while emerging market equities tracked by MSCI trade at 16.1. MSCI All-Country World Index excluding the U.S. trades at 19.7. In key economic data last week, import and export prices both declined in June, led by a sharp drop in oil prices. New housing construction starts rose by 8.3% last month, rebounding from 2.8% decline in May that was upwardly revised from the 5.3% pullback originally reported. The closely-watched Philadelphia Fed’s reading of manufacturing business outlook stumbled to 19.5 in July from 27.6 the month prior. The reading has fallen consistently from its 33-year high reached in January. Lastly, the Conference Board’s index of leading economic indicators rose 0.6% in June, outpacing economists’ consensus forecast for a 0.4% increase. For the week, the S&P 500 rose +0.56% for its third consecutive weekly gain, the Dow Industrials slipped -0.27% and the MSCI EAFE (developed international) +0.47%. At the start of this year, analyst forecasts for 2017 earnings were quite optimistic, and for good reason. By the end of 2016, U.S. economic data were improving, the headwinds from weak oil and a strong U.S. dollar appeared to be dissipating, and hopes were high for policy reform in Washington. These lofty expectations were met with robust earnings growth in the first quarter, but as the year has progressed, investors have begun to fear that the tide may be turning – as recent headline economic data has been mixed, oil has fallen into a bear market, and the hopes of any fiscal spending and tax reform have begun to dwindle. Despite this, earnings expectations have still held up remarkably well in 2017, especially when compared to the average path of earnings estimates over the past 20 years. 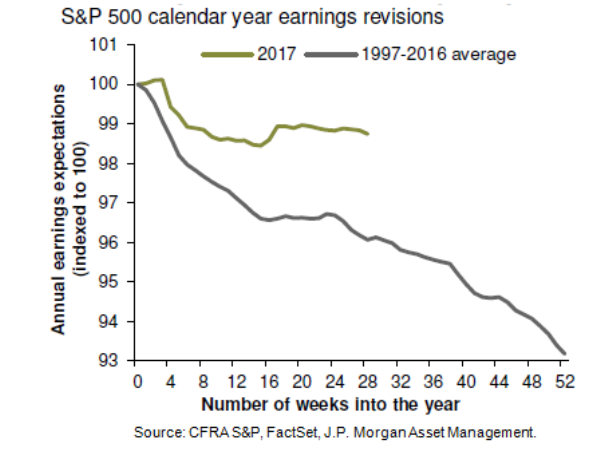 As Chart 1 shows, annual earnings have typically been revised down roughly 4% at this point in the second earnings season, but this year, earnings have only been revised down 1%. Though earnings growth may slow from the robust levels seen in the first quarter– and subsequently lead 2017 estimates lower– a more moderate pace of earnings growth should be sustained thanks to a range-bound dollar, more efficient energy operations and accelerating economic growth outside of the U.S. Furthermore, any policy reform would be icing on the cake, as the current earnings environment should support a slow march upward for equities even if Washington remains gridlocked.